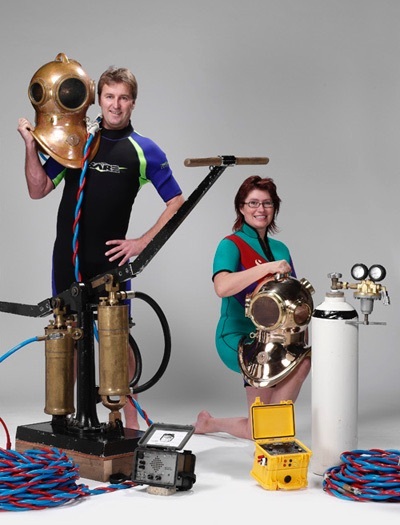 Helmet diving enthusiast Kees de Jonge from Helmond, Holland started his ‘Dutch Diving Helmet’ project in 2002. Kees explains several advantages of his helmet: The Dutch Diving Helmet is made of cast bronze and weights about 24 kg. Lead weights are not needed. The helmet is ergonomically shaped, it fits like a glove. There are two models, of which one has a slightly different shape and size. We use bronze because this has many advantages. The first advantage is a that a bronze helmet has a very long lifetime and that it can not be influenced by ultraviolet light which is produced by the sun: sunlight weakens plastics. 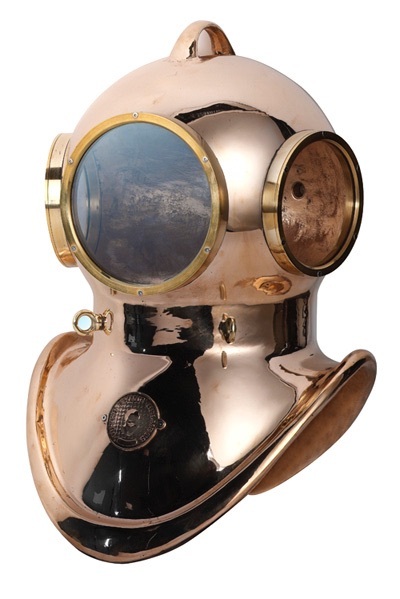 The second advantage is that the Dutch Diving Helmet will be a wanted collectors item in the future: plastics are thrown away after use.The last advantage is that a bronze helmet has no external or internal weight added: a bronze helmet combines a beautiful design with usefulness. We have two different sizes: normal and large. The larger helmet is slightly heavier and different shaped. In this way large persons can use this helmet without any problem. All the Dutch Diving Helmets are fitted with the same windows and connectors. Spare parts can be exchanged. The inside of the helmets is painted with a special underwater paint. The ergonomic shape guarantees a perfect fit. We only use original diving hoses and connectors as are used in the off-shore industry. These hoses are tested and offer a maximum protection for underwater use. There are several ways to deliver air to the diver. Option 1 is to use a diving tank with a regulator. This system is easy to handle and very flexible. Option 2 is to use an air trolley. 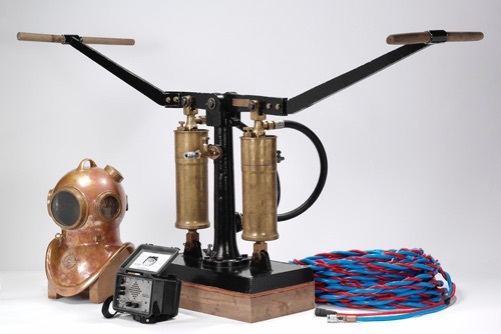 This trolley is fitted with three diving tanks and a in-build regulator with a high and low air gauge. With an air trolley, one can transport the tanks very easy and comfortable. This system is ideal if you use two helmets simultaneously. Option 3 is the use of a complete multiple helmets air system. We have tow examples: a regulator case with several in- and outlets or a complete air set consisting of a Lenhard & Wagner HP compressor, 50 litre buffer tanks, air manifold and hoses. Contact us for the best solution for your business plan. If you know what you want, we can make it according to your wishes.